“He wanted to be president less than anyone I’ve met in my life. He had no desire to . . . run,” said Tagg, who worked with his mother, Ann, to persuade his father to seek the presidency. “If he could have found someone else to take his place . . . he would have been ecstatic to step aside. 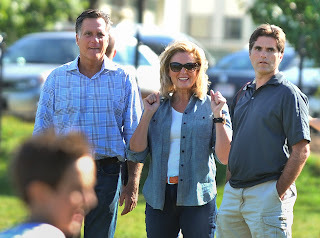 So we are supposed to believe that that Romney was not interested in being President and ran because he could not find "someone else to take his place"? Seriously? Mitt Romney was a terribly flawed candidate. In an era in which populism is increasingly dominating politics, the Republicans managed to nominate the least populist candidate in the country. Romney had no appeal whatsoever to working men and women who are still reeling from the worst recession since the great depression. The GOP nominated Mr. Wall Street at the same time people on the right and left are still furious from the corporate bailouts and executive bonuses that are a legacy dating back to the last year of President Bush. The field Romney ran against in the GOP primaries was indeed weak. But that was due chiefly to the fact that bigger name Republicans did not want to enter the race against a candidate who had the Romney's campaign organization and establishment support. Romney's presence in the race kept many much stronger candidates, candidates who could have ran a much better campaign and defeated President Obama, out of the race. Indeed it is astonishing that, as weak a candidate as Romney was, that he managed to do as well as he did. Just to say that his lack of commitment to this candidacy seeped through his every appearance. The fire was never there and you could see it in his tortured countenance and squirming presence. Probably hated almost every moment except those of orchestrated adulation. There had best not be a "Romney" political dynasty. Sons like this should be kept muzzled.